When Nigerian music star, Davido released his song "Fall" in 2017, it became an instant hit not only in Nigeria but across Africa and went on to become one of the biggest songs of that year. Now according to a new report by Rolling Stone, "Fall" is reportedly taking over radio stations in the United States. "The Nigerian style of music known as Afrobeats has quietly entranced a large swathe of the world's population. "Pretty much every song on pop radio [in the U.K. now] is sort of a Mr. Eazi-style, chill, afrobeats [track]," the producer Riton told Rolling Stone last year. But Nigerian singers have not yet established a foothold Stateside, despite well-received, afrobeats-dusted singles from established stars like Drake and Janet Jackson. So it's unusual that "Fall," a springy, 19-month-old track from the Nigerian singer DaVido, is currently gaining traction on the airwaves. The growth has been gradual: 482 plays to date, spread across 36 stations, according to Nielsen BDS, which tracks radio activity. BDS reports that four new stations added "Fall" into rotation last week. Those are admittedly not huge numbers -- for comparison's sake, Post Malone's new single "Wow" grew by 1,700 plays last week alone. But listeners who hear "Fall" are scrambling to find their phones: It was one of the Top 100 most Shazam'd singles in America this week. In New York City, "Fall" was a Top 10 record on Shazam. And in Atlanta, another crucial market, only two tracks were getting more Shazam activity than DaVido's. Eliciting that level of interest in America is no small feat for an African singer. Columbia signed "Pana," a 2016 single from Tekno, but wasn't able to transform it into a U.S. hit. RCA signed Wizkid, the guest on Drake's "One Dance," but hasn't been able to get a hit either. (RCA is also working with DaVido now.) Burna Boy, another Nigerian singer with impressive talent, is now affiliated with Atlantic, but his "Rock Your Body" didn't reach a wide audience in America. That has nothing to do with the music -- "Pana" and "Rock Your Body" are both indelible polyrhythmic pop songs, wonderfully weightless next to the lead-footed trap that currently dominates both rap and pop radio in America. But the machinery that creates hits in the U.S. remains conservative, even in the supposedly "new" era brought on by streaming. Nowhere is this more true than at radio, which throws its still-considerable weight behind only a tiny number of tracks -- "A Top 40 radio station is playing five songs 120 times a week every week," according to one radio insider -- and rarely takes risks on music that doesn't align with seemingly-ancient-if-not-totally-incomprehensible norms. Mainstream "urban" radio usually won't play Latin trap next to American trap, even if the same producers worked on both tracks, or pivot from hard hip-hop into soft R&B. Meanwhile, pop radio tries hard to ignore viral rap records, which programmers characterize as "pretty extreme," in favor of bizarre but ostensibly more palatable concoctions by Panic! at the Disco or Marshmello. Even some Top 40 programmers are confused by this tendency: "I don't know when everybody's gonna get it through their heads that we can't just keep forcing these pop songs that nobody likes down everybody's throat," Nathan Graham told Rolling Stone last year. This is costly for artists without American passports. "To work the U.S. is big money -- even getting music onto radio in New York alone might cost you upwards of $100 or $200 grand," the Nigerian star Mr. Eazi explained to Rolling Stone last year. 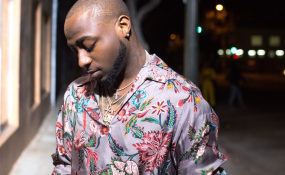 That's another reason why, "at the end of the day, nobody has properly broken an African act in the U.S."
It's too early to tell if Davido can establish a new path from Nigeria to the American airwaves -- his team only recently started "attacking US radio properly," according to an email from the singer's manager, Asa Asika. But there's no denying that when listeners hear DaVido's music, they are immediately compelled to figure out who sings it. And that's not just the case with "Fall." This week New Yorkers were also trying to determine who steals the show on local rapper Casanova's new single "2am" (Shazaming Top 25). Surprise -- it's DaVido. He is also the artist behind the 2017 track "If," which is Shazaming Top 50 in New York. Davido's success appears to be a boon for other Nigerian artists as well. Afro B's "Drogba (Joanna)" was even higher than "Fall" on New York Shazam this week. If more radio programmers are willing to give these artists a chance, they may be pleasantly surprised by the results."